Citadel Warhammer Quest Slayer/Dwarf Dragon Slayer (1998) | Azazel's Bitz Box. 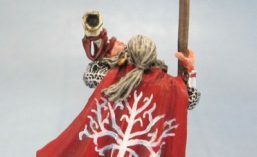 This entry was posted in Age of Sigmar, Dwarven Grudgebearer Army, Kings of War, Warhammer Fantasy - 9th Age and tagged Dwarven Slayer, Troll Slayer, Warhammer Quest, WFRP. Bookmark the permalink. Lovely clean, crisp finish to him that works perfectly. What you haven’t mentioned is your painting of his face that gives him real expression, particularly with the dark rings under his eyes – he looks like the disgrace that turned him into a Slayer plays on his mind constantly and he hasn’t slept properly in years… Great work. Thank you! In all honesty though, the face was painted long ago – shortly after I got the figure and I can’t remember how much of it is my own and how much of it was Matt’s (he’s an outstanding painter). Indeed beautiful. The rich colours and colour choices guide the eye taking all the lovely detail on this sculpt. I think you did an excelelnt job with the embossed detail f the axe. How did you achieve this effect? 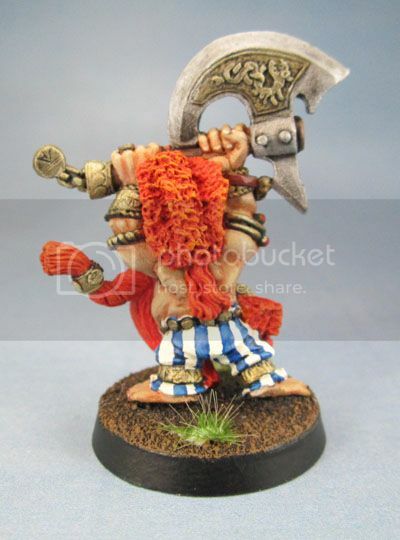 The Obelix pants are obviously an excellent choice for a bulky dwarf. I think the head kind of works. 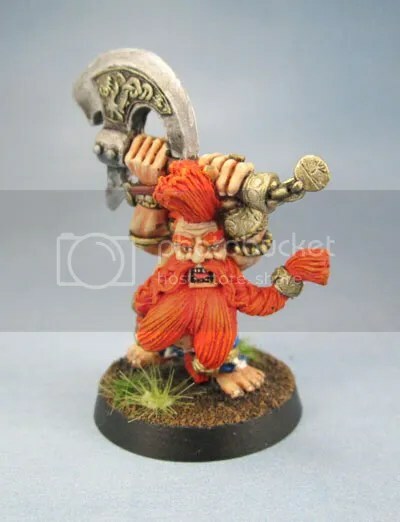 It would not surprise me if dwarves would have larger heads in general, after all they are not human. Thanks! I recently got hold of (well, found) VMA067 Bright Brass which I realised would be a great match with VMA066 Gold – which is a much “whiter” gold than most. Instead of starting with brown, I started with black, then brass, then gold, washed it down with thinned black wash, then picked out the highlights again. It gave a nice effect – a much “colder” brass/gold look than most paints and what I’m used to producing. 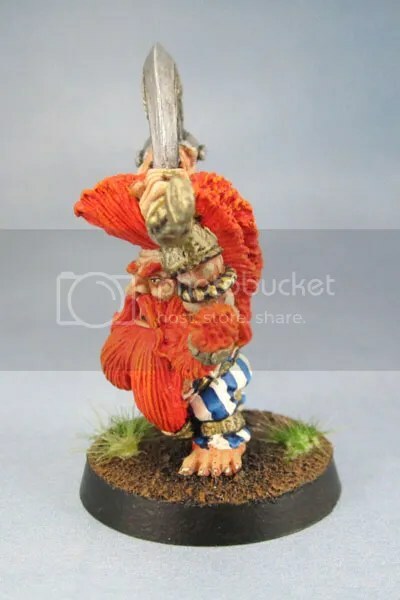 I did have Obelix in the back of my mind when I painted him, what with the braids and all but the stripey pants started initially in homage to the old-school paint schemes for such figures. 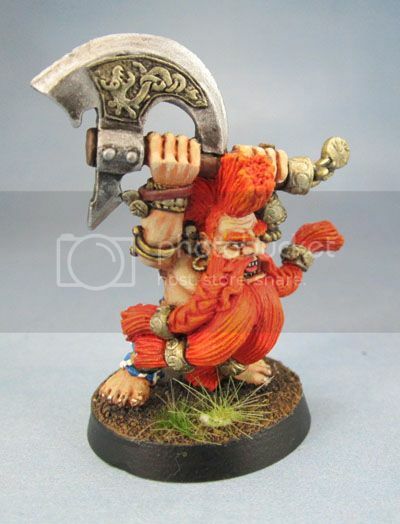 Pingback: Citadel Miniatures’ C20 Trolls – All four! | Azazel's Bitz Box. Pingback: Citadel Warhammer Giant Slayers (1994+) | Azazel's Bitz Box.